The “new era” of possible funding opportunities enabling cooperation between universities both inside and outside the European Union started early last year and will hopefully retain the same structure until December 2020. Since January 2014, most of the universities and their advisors for opportunities abroad had been facing a maze of similar yet different possibilities for reshaped and renewed programmes. Unfortunately (to my knowledge), not all the programmes that ended on New Year’s Eve 2013 had been ready for use at the beginning of 2014, but this situation was pretty quickly remedied. This article tries to briefly describe the beautiful maze of possible EU and non-EU university cooperation (including Switzerland, Norway, etc.) that could open doors for you. According to my research, EU and non-EU universities have the following possibilities for cooperation: (1) Erasmus +, (2) European Neighbourhood Instrument, (3) HORIZON 2020 and (4) European Territorial Cooperation. So let the tale of the doors in the maze begin. I would like to start with the very attractive, 300-page-long condensed document that briefly describes the opportunities provided by Erasmus+. For those who knew the 2007-2013 programmes, the opening of this particular door would be easier because Erasmus+ replaced the Lifelong Learning Programme (Erasmus, Leonardo da Vinci, Comenius and Grundtvig), the Youth in Action programme, five international cooperation programmes (Erasmus Mundus, Tempus, Alfa, Edulink, the programme for cooperation with industrialised countries, including the Intra-ACP programme, the EU-Canada Cooperation Programme and the EU-USA Atlantis Programme) and the new sport action. Decentralised actions include opportunities for students, trainees, teachers and staff for learning and/or professional experience in another country. Programme and Partner countries are eligible except Regions 5 and 9 and ACP and Gulf countries. Centralised actions cover Joint Master Degrees, Erasmus+ Masters Loan Schemes and Large Scale European Voluntary Service Events. Programme and Partner countries are eligible. Decentralised actions are accessible to Programme and all Partner Countries and aim to develop initiatives addressing one or more fields of education and/or training. One centralised action worth mentioning is Capacity Building, which aims to support the modernisation and internationalisation of HEI in Partner Countries belonging to Regions 1 to 4 and 6 to 10, the Special mobility strand accessible to Partner Countries belonging to Regions 1, 2 and 3 and IT support platforms offering virtual collaboration spaces, databases, online services and more. Decentralised activities cover meetings between young people and decision-makers in the field of youth. Centralised activities include exchanges of knowledge in the fields of education, training and youth, the creation of prospective initiatives and cooperation with international organisations. Includes academic modules, chairs, centres of excellence, policy debates with the academic world, support for institutions and associations and studies and conferences. Jean Monnet is accessible to all countries in the world active in EU studies. Sport could be used as foundation for collaborative partnerships, not-for-profit European sport events and actions that strengthen the evidence base for policy-making. Cross Border Cooperation, mainly aimed at progress towards “an area of shared prosperity and good neighbourliness” between EU members and their neighbours in eleven priority spheres. These spheres cover support for education, research, technological development and innovation, as well as subjects like climate change, social inclusion, business, good governance, sustainable energy, accessibility and security, which could be used for university cooperation. In addition, each border EU member country has its own specifications for the cooperation mentioned in its Action Plans or similar documents. European Neighbourhood and Partnership Instrument bifurcates the maze’s path even further. These two paths share the priority themes, such as civil society, economic and rural development, education and employment, boosting small business, energy cooperation, natural resource management, climate change adaptation, transport connections, easier mobility for people, human rights and justice. However, they differ in the area they cover: (A) Mediterranean countries (Morocco, Algeria, Tunisia, Libya, Egypt, Palestine, Lebanon, Israel, Jordan and Syria) are eligible for EuroMed and (B) Eastern countries (Belarus, Ukraine, Georgia, Azerbaijan, Armenia, Russia and Moldova) are eligible for EuroEast. The third door, when opened, shows four different INTERREG paths, some of which are shorter than others. What is certain is that the last one divides into three more paths. INTERREG Europe targets universities, knowledge and research institutes and institutes for higher education, among others, for the purpose of exchanging experiences on thematic objectives, creating more jobs and growth while supporting European cooperation and cohesion. All EU member countries plus Switzerland and Norway are eligible for this programme. INTERREG North West Europe promotes the economic, environmental, social and territorial future of this region with a focus on innovation, low carbon and resource and material efficiency. Belgium, France, Germany, Ireland, Luxembourg, The Netherlands, Switzerland and the United Kingdom are the eligible participating countries. The Northern Periphery and Arctic Cooperation Programme helps northern peripheral, sparsely populated and remote communities with low accessibility, low economic diversity, abundant natural resources and high climate change impact to develop their economic, social and environmental potential through innovation, entrepreneurship, cultural and natural heritage protection and energy security promotion. This programme is accessible to Finland, Ireland, the United Kingdom, Sweden, Faroe Islands, Greenland, Iceland and Norway. South East Europe, the fourth INTERREG programme, is divided into three different paths. The Adriatic Ionian Programme is established for Greece, Italy, Slovenia, Croatia, Albania, Bosnia-Herzegovina, Montenegro, and Serbia in order to support transnational capacity-building by developing common tools and taking an innovative approach. The Danube Programme is accessible to Austria, Bulgaria, Croatia, Czech Republic, Germany, Hungary, Romania, Slovakia, Slovenia, Bosnia and Herzegovina, the Republic of Moldova, Montenegro, Serbia and Ukraine and aims to achieve a higher degree of territorial integration through research and innovation, transport, governance and resource efficiency. Finally, the Balkan-Mediterranean Programme promotes economic, social, environmental and institutional cohesion and development using innovation, entrepreneurship and good governance. Eligible countries are Albania, Bulgaria, Cyprus, Macedonia and Greece. The Excellent Science Pillar is another door leading to two paths for EU and non-EU university cooperation. (A) Marie Skłodowska-Curie Actions support individual fellowships, innovative training research networks, staff exchange, the co-funding of international and national programmes that finance fellowships involving inter-country mobility and Europe-wide public events stimulating interest in researchers and their carriers. (B) Future and Emerging Technologies aim to initiate new lines of technology. These new lines should be achieved through unexplored collaborations between advanced multidisciplinary science and cutting-edge engineering. All four doors that I was identified in this beautiful and complicated maze, when opened, show many different paths leading to further doors of opportunities. This article has attempted to briefly describe opportunities that may just what you are looking for. Each door holds documents a few hundred pages long. Sometimes you just need to read them once and sometimes that is not enough. If the websites are working properly, you can find most of the relevant information on them. I wish you luck regarding the possibilities awaiting you. About Eva Grolikova: Student of International Development Studies at Palacký University (CZ). As an intern, learning a lot of interesting things, I’ve been part of SIRIS team for the last few months of 2014. 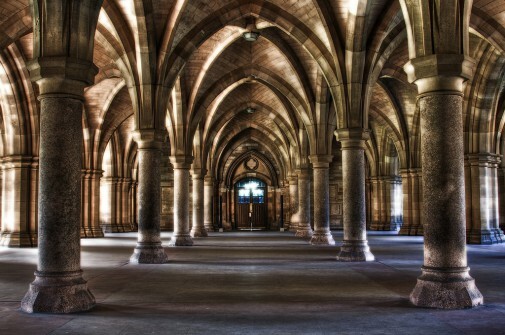 Information about Featured Image: Cloister, Glasgow University by _skynet. Available here. Russia is not part of European Neighbourhood Policy, but for better understanding is included in EuroEast by the ENI itself. Russia connected to the EU through Strategic Partnerships with four common spaces (Economic Space; Freedom, Security and Justice; External Security; and Research, Education and Culture).